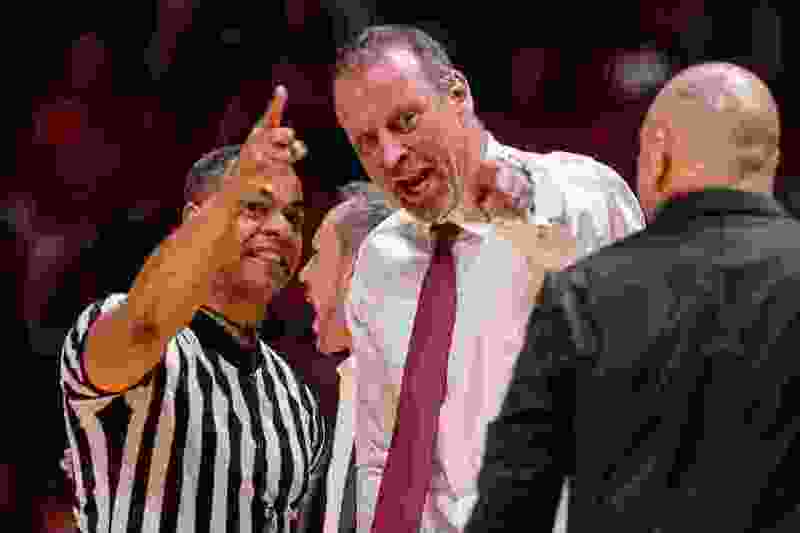 (Trent Nelson | The Salt Lake Tribune) Utah coach Larry Krystkowiak argues with an official as the University of Utah hosts USC, NCAA basketball at the Huntsman Center in Salt Lake City, Saturday Feb. 24, 2018. Arizona freshman Deandre Ayton has been named player and newcomer of the year on the All-Pac-12 Conference men's basketball team announced Tuesday by The Associated Press. Utah coach Larry Krystkowiak was named coach of the year. Ayton was one of the nation's top incoming recruits when he arrived in Tucson and lived up to expectations during a stellar freshman season with the 15th-ranked Wildcats. "He's a once in a generation player," Arizona coach Sean Miller said. "I doubt if I'll coach anyone like him again." The 7-foot-1, 260-pound big man from the Bahamas became the first Pac-12 freshman in 25 years to average at least 19 points and 11 rebounds, finishing with 19.9 points and 11.4 rebounds during the regular season. Ayton is the second freshman to lead the conference in rebounding, joining California's Leon Power in 2004. Ayton shot 61 percent from the floor and was a force on the defensive end as well, finishing with 59 blocked shots to tie for seventh-most in conference history by a freshman. Behind Ayton and first-team all-Pac-12 guard Allonzo Trier, Arizona overcame a season of turmoil to win its fifth Pac-12 title in six years. Ayton is projected to be a top-five pick in this year's NBA draft. Utah was picked to finish seventh in the Pac-12 preseason poll after losing four of its top six scorers, including Kyle Kuzma, now with the NBA's Los Angeles Lakers. Krystkowiak molded the Utes into a potential NCAA Tournament team, leading them to 19 wins and the No. 3 seed in this week's Pac-12 tournament in Las Vegas. Led by seniors David Collette and Justin Bibbins, Utah won five of its final six regular-season games and is in decent position to reach the NCAA Tournament after missing it last season. Aaron Holiday, UCLA, G, 6-1, 185, Jr, Chatsworth, Calif.
Jordan McLaughlin, USC, G, 6-1, 185, Jr, Etiwanda, Calif.
Chimezie Metu, USC, F, 6-1, 225, Jr, Lawndale, Calif.
Justin Bibbins, Utah, G, 5-8, 150, Sr, Carson, Calif.
Voting Panel: Doug Haller, Arizona Republic; Bruce Pascoe, Arizona Daily Star; Lynn Worthy, The Tribune; Pat Rooney, Boulder Daily Camera; Tyson Alger, The Oregonian; Anthony Gimino, Tucsonnewsnow.com; Jesse Sowa, Corvallis Gazette-Times.